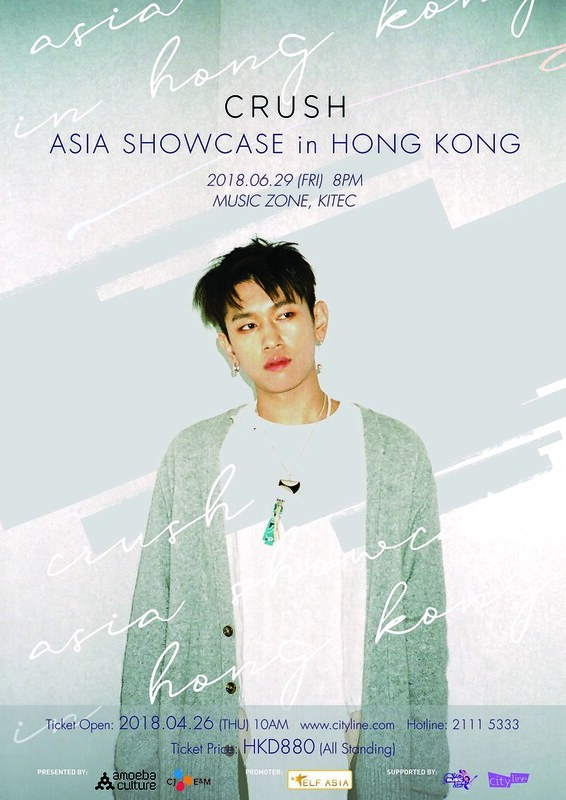 Hong Kong, 2018 – Mark your calendars as CRUSH will be holding a showcase in Hong Kong on 29th July (Friday) at KITEC Music Zone. CRUSH debuted in 2014 as a solo artist but prior to his debut, he has already worked numerous musicians and has shown immense talent in both composing and singing. ‘Beautiful’ – OST of drama ‘Guardian: The Lonely and Great God’, ‘Sleepless Night’ – OST of drama ‘It’s Okay, That’s Love’ are just one of the few popular works of CRUSH. Through this showcase, fans will be able to see all the special performances that CRUSH prepared and of course, see him perform the live version of ‘Beautiful’. Tickets will go sale on 26th April, 10am via http://www.cityline.com, hotline: +852 2111 5333, and various cityline ticketing outlets. Tickets are priced at HKD$880 and it will be a seated event. This event is proudly brought to you by ELF ASIA.